CBKZ-X70FX is the 4K Upgrade Option for PXW-X70. This option allows X70 to activate 4K(QFHD) XAVC Long GOP recording capability. In this guide, the way to install the option on the PXW-X70 is described. Follow the steps below for the installation. Install the option on the PXW-X70 by the install key. • To use the 4K (QFHD) recording function, the software version of the PXW-X70 needs to be Ver. 2.00 or later. Confirm the software version of the camcorder you are using. Press the MENU button select the (OTHERS) menu [VERSION DISPLAY]. • When the software version is earlier than Ver. 2.00, update the software first. For details on how to update, see the Sony Website for professional products. You need your user ID, name, e-mail address, company name, and country/area information to register. You will receive an approval e-mail containing a password. It may take awhile until you receive the e-mail. Select “Install Key Request” in the top left of the screen. Confirm that “CBKZ-X70FX” and “4K UPGRADE LICENSE” are shown in the “Model Name” and “Description” fields respectively. • The install key is issued even if you input the “Unique Device ID” incorrectly, however, you cannot install the option (4K (QFHD) recording function) on the camcorder. Be sure to check the input and to correct it if it is incorrect. Select “OK” after you have checked the input. The message “Completed your Install key request” is displayed. You will receive the following as individual attachments to tworespective e-mails. 1 Use a PC to copy the ”Install key list” (a file without an extension) you have received via e-mail onto the root directory of a Memory Stick or an SD card. 2 Insert the Memory Stick or SD card that contains the install key list into the memory card slot A of the camcorder. 3 Press the MENU button of the camcorder  select the (OTHERS) menu  [OPTION]  [INSTALL OPTION]  [OK]. • The camcorder reboots and installing the option completes. • If you have failed to install the option because the unique device ID you input was incorrect, or etc., please contact us from the “Contact us” portion of the web site shown below. to Panasonic, JVC, Canon : your greed is nothing compared to this. But don’t even think about it, see ? it doesn’t work and will give to people one more reason to stay away from the brand. The sales won’t even cover the money spent to build this greedy experiment here and the bad light for the brand will be a disaster (for the sales of the other stuff as well). 3. greedy and playing with the customers (like this 4K idiotic thing here)? A Disaster. You can’t possibly offend the intelligence of ALL of your customers at once? what are you crazy? Can’t get into the ecspert site to register .Keep getting a sony screen ‘400 Error- bad request. Can get into the ecspert log in site but can’t find a way to register. Finally got it, sorry, now starting into the maze! Well, Got ID etc then tried to log on to the site only to be told ‘please input in half size alphanumeric characters’ I’ve no idea how to do this, I’m using Safari and an iMac. The site seems to be 10 years old and asks me to use IE, !!!!! I think this is a maze type game and if you ever get there you win a prize. Why on earth have they made it so difficult? All that and yet you get the lowest 4k-bitrate in the business. Even lower then the far cheaper consumer focused 4k cameras. At least they could double the rate and give us 4k 50p. Wouldn’t that be something? I think it’s fair to say that this 4K “upgrade” price has been almost universally condemned, I do wonder if anyone at Sony is paying attention! I think most people would have paid perhaps £100 for this (low-end 4k) update but £360 + VAT is pretty outrageous and it is conceivable that customers will look and possibly go with other brands – not s smart business decision! Maybe they should get a teenager to write the code so that it works !!!! Download to a SD card, insert and let the software figure itself out. Can’t be that difficult !!! Still waiting for them to finish my FDR-AX1 !!! This is a mess of price gouging and an insult to customers. I will use v2.0 but won’t buy the 4K. I didn’t but the camera for 4K but thought I’d try when it came out … until I saw the ridiculous price. I’ll use this camera as 1080p, and sell it without the 4K upgrade when I’m done with it. I’ll never buy anything with a future “promise” from Sony, can’t trust them on that. @Ron Evans it’s not that simple: we have to give it to Sony that’s not easy and that it was never attempted before : this is the VERY FIRST time that I see a paid upgrade with the product already sold to the Customer. It’s a very dangerous precedent because now we could expect stuff from Sony with locked software to be unlocked after a year if we don’t pay more… stuff like that. It’s not a joke, people, not a joke at all. In the specifics they have to protect the upgrade from hackers and stuff like that: it’s the first time and they are not used to… and we are not used to. Until now we only had upgrades that made the product work better, not to UNLOCK features for money. It’s bad for us, very bad. Let’s hope that this will be reviewed and regulated and possibly made illegal: it’s too dangerous to allow paid “unlocks” after the sale of the product (any product). Also at Sonys PMW 400 Sony said from future upgrade, at first time buyable, at the last free of charge. But 500 Euro for that 4k-upgrade is really too much, because in the US-market is still an 70%-rebate running, in Europe, Sony didn`t know anything like an rebate. It’s for reasons like this, as well as others, that I will never give Sony my money again. And to add insult to injury, our US cousins allegedly get a rebate program & basically get this 4k ‘upgrade’ for just $200. I was due to purchase another 2 X70’s in the next few months, but after this debacle I’m going the JVC HM200 route – So long Sony & thanks for all the fish! I have to say I am truly flabbergasted at this, I bought the camera knowing there was to be an upgrade later, albeit paid, but was totally disappointed at the price. I wish I had bought another camera now that was 4k and I would have been prepared to pay the extra.Nevr mind wont upgrade and will look elsewhere when upgrading all my cameras. You own the X70, do you think is it worth the 4K update being only 60Mbps 402 8 bit?. The 422 10 bit in HD mode of the X70 is great but the AX100 with the new 100 MBps firmware is very tempting. ADISKIN007 …no joke …but you did notice those are New Zealand Dollars not US Dollars? At todays rates (1 GBP = ~2.29 NZD) 899.95 NZD comes in at ~£393 so actually slightly ‘cheaper’ than the UK price of £432 inc. VAT. Either way it’s way too expensive for the disappointing 60Mbps 4K ‘upgrade’ offered (even my GH4 had 100Mbps 4K from launch in May 2014, plus it can also record Full HD 25p/50p at up to 100Mbps IPB and 200Mbps All-Intra). Sony say they are “looking to possibly support a higher bit-rate mode than the 60Mbps for 3840×2160 XAVC-L in the future” …if I were a PXW-70 owner I don’t think I’d be holding my breath on that one. For someone requiring 4K in the camcorder format, with large sensor and recording to sensibly priced media, I’d be taking a closer look at the forthcoming Panasonic AG-DVX200 which will offer 4K 50p (150Mbps) and Full HD up to 120fps (from launch …not vague, possibly costly, future ‘updates’). OK, it’s going to be twice the price of the Sony PXW-70 but at least it should be fully capable from day one! Even the newly announced Sony RX10 II includes 100Mbps XAVC-S, for both 4K and Full HD (1920 x 1080/100p), and is in many ways technically superior (fancy new ‘1.0-type stacked CMOS image sensor’, 4K from launch!, Full HD fast framerates [including 250fps bursts at almost Full HD], fast constant aperture [& slightly wider] power zoom lens, higher res. EVF etc.) to the PXW-70 so could potentially replace it in many situations where the camcorder format is not essential …at ~half the price. Seems to me like £420 for 4K 25p 60mps, is quite limiting but I will do some tests and see what it looks like. Hi Matthew, the cameras can be switched from PAL area to NTSC area and therefore give you 24P or 30P. It is easy to do this in the menu. So all PXW-X70 sold in Europe are what are known as ‘World Cams’ so can be used in either 50i/60i or 30P/24P/25P. Regards Bill. PS. Sorry it was not clear from our feedback! You all are a big bunch whiners. This is the only site I’ve come across- and I’ve looked at more than 20, doing hours of research on the 4K upgrade- and no one has complained about being gouged except you bunch of hens. Chances are most of you don’t know much about professional cameras- because this type of thing has been going on for a while and Sony isn’t the only one to do it. Why does an upgrade cost anything? Well, technology moves so fast now that it’s possible to put out a product that is worth X amountof money– but in the near future it’ll be possible to do the work to offer new options. It’s like you think programmers and engineers should work for free. THere are far more expensive upgrades out there that are absolutely worth it if you shoot for a living. And enough with “THE LOWEST BIT-RATE IN THE INDUSTRY!” Bit-rates aren’t created equal. Sure, it’d be nice to have a higher bit-rate, but chill out everyone.WHen bit-rates are higher other things have to give. Higher priced SD cards or more expensive cards. This isn’t Sony’s top professional camera by any means and I thin what it does at its price (including the 4K upgrade cost) is pretty amazing. Notwithstanding your opinionated rant, had you read more carefully, you’d have noticed that some of us were concerned about what the actual upgrade price is (given this was not communicated until after everyone had made a purchase), not that fact that Sony charges something for it. A number of commenters (like myself) are professionals and have used a range of cameras, and this seems to be one of the first times this type upgrade path has been attempted on a low-end camera like the PXW-X70. £100 – £150 would have been somewhat reasonable, but over £400 is overpriced. Maybe you are used to paying high prices for “feature” upgrades after the original purchase, but please name a “far more expensive upgrade” to a camera in this price range. Given their AX100 does 100Mb, people expected at least the same bitrate for this “pro” camera, and maybe the 60Mb is just as good as the 100Mb from the AX100, but Sony can definitely do a better job of marketing and communicating this, if it is the case. The 4K upgrade is here! It’s easy to install and Sony has the loyalty program. The box will have a sticker that tells users to visit a webpage where they get contact info for POSC…. gives you ‘inside’ access and can help you upgrade in 5 – 10 minutes. 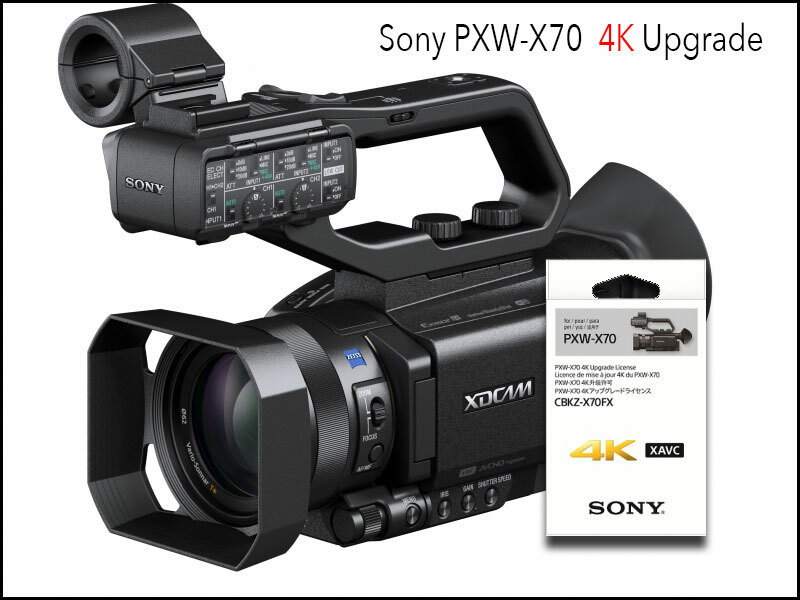 Sony wants to show their appreciation to early adopters of the PXW-X70 camcorder: End-user purchasers of PXW-X70 who took delivery of their product on or before March 31, 2015 and who purchase a CBKZ-X70FX 4K license key between June 15, 2015 and August 31, 2015 are eligible to receive a $300 mail-in rebate from Sony! I bought this camera, working well but the worse part of it was and still is that the licence key what i got from Sony with the camera for Software download (CONTENT BROWSER 2) never worked. was really bad service , They told me that i have to contact the USA branch. When contacted them they told, NO you have to contact UK branch. So like this they passed 3 months saying me from both sides and i was sending every second day email for what they need all infos, Like what system i used ,serial number etc, etc. because every time was new contact person,and time to time they offer me another software which i have to pay , they didn’t feel any shame and solve the problem. At the end after 3 months of playing they said just simple that we cannot solve your problem and even didn’t say sorry or any excuse. So i got tired and i let it go as it , but i will never buy Sony products for future even they are good. I will give it ZERO. This camera is compatible now with FCPX ?